these gals have been patiently waiting on my desk for their photoshoots. they have been pokey pokersons. some sitting around for days with no hair, weeks with no faces, months with no outfits. now they’re all finished and waiting for the sun, and for me to have the time and concentration to do some set ups. what a great photo of them sitting with their tea party! Oh, and I meant to also say that you have beautiful china! They’re beautiful! You did an incredible job on these ladies! How on earth do you attach their hair? Would you ever consider doing a tutorial? I adore these! They are just the cutest! Ditto on the hair question: sewn? Glued? They look fantastic!! I wish I had the talent & patience to make dolls that cute. Now that’s my kind of tea party! love your sweet dolls….reminds me of my childhood…. Will you be selling patterns for these gals? I’d love to have some of them around my sewing room. PS. I got your make-a-long patterns for Christmas and can’ wait to start my own Olive and Archie set. These are just adorable, perfect for a tea party! These girls are absolutely adorable. The hair is beautiful and their eyes are so sweet. round head dolls! Great yarn choices. Ack! The blue-haired one!? I am seeing that right, right? We’ve been waiting ever so patiently for these dolls to make their debut! I’m not sure we have much left… they are my favorites!!! Love the dolls! Especially the Asian on the left- she looks just like my beautiful niece! And I second the pattern request :o) Spare us trying to figure these out on our own! ohhh the hair, the hair! But what do you sew it on with? Presumably not the yarn that is the hair, wouldn’t it be to thick? I was thinking of trying this using that invisible nylon sewing thread….. These guys look like Ingrid and whats-a-name, the make-a-long doll body with that rounded head from the butterfly. I’ve been meaning to try and give this a go, this may be just the inspiration to get me moving on it! Thank you, they are lovely, did I mention the hair? I’m glad you got them some tea while they’re waiting. I LOVE them – they’re SO cute (I’m a sucker for dolls with big round heads) : D Great job! what a sweet little girly scene. Oh, for cute. You are a whiz with doll hair. So excited to see what you do with these! Makes me wish I had a daughter! 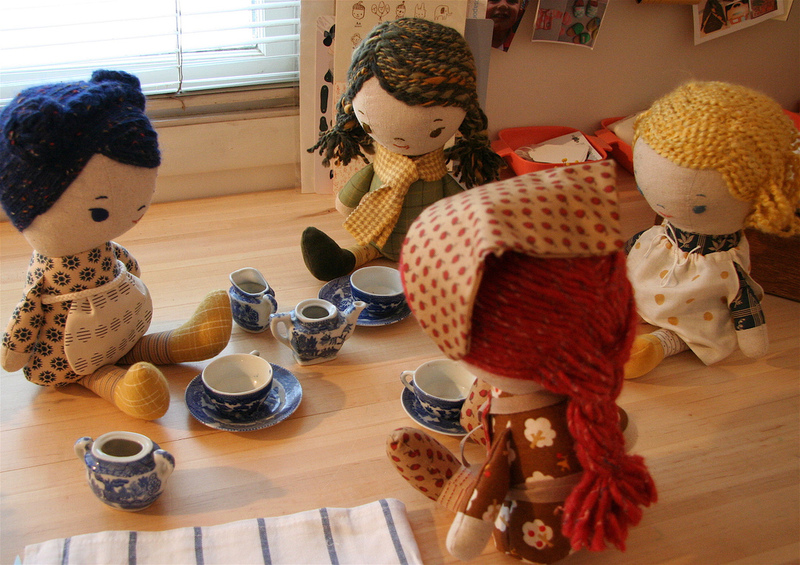 They are adorable and I love that they are having a wee tea party. Hahahaa – I thought you said “Pokerpersons” as in – instead of a tea party they were playing poker! These little gals look like they could do that too, ala the movie Mr. Mom – with coupons, heehee. The anticipation is killing me…I just can’t wait! I missed out on your last postcard set. Hope to snag the next ones up! Ummm….Wow! Those are so very cute. I especially like the raven haired beauty. Is that a blue willow tea set? Your talent is so inpiring! Now I need to have a cup of tea. The dolls are so cute – their round heads and little bodies remind of the Joan Walsh Anglund dolls I used to have as a kid – sold by Hallmark, I think! We’d love to have a pattern! And I’m about tearing my hair out with this ugly gray Chicago light. I just opened an Etsy shop and trying to take pictures that don’t look totally depressing is hard. I love their hair, especially the buns. Oh my gosh,how cute! I love the dolls and the props you used for the picture! Wow they are really adorable!! they are fantastic! is that a japanese doll? if, so she is adorable! I would so buy this pattern!!! Very Cute! Now that’s a tea party i wish i were at. They are really adorable and colorful.